so obviously, i needed to crochet yet another hat, right? i’ve been wanting to make a newsboy hat for quite awhile. despite looking at seemingly hundreds of patterns, i never found one that i liked – or if i did, the projects on ravelry discouraged me because they either didn’t look that great or people said they needed to heavily modify the pattern. then i found this pattern, complete with tons of successful project photos and comments, so i decided to give it a try. i love it! it took about 3 hours and the instructions were very easy to understand. the only modification i made was leaving out one row at the end of the main cap because i didn’t want it quite as slouchy. it’s perfect! haven’t added buttons yet because i didn’t have any laying around. maybe i will add some eventually, but this is wear-in-public-worthy as is. the brim was pretty floppy originally, so i shaped it and sprayed on some starch and that seemed to do the trick. the fella isn’t always a huge fan of my crochet creations, but he even thought this was a pretty stylish hat! i have a lot of hobbies. i cook and bake – usually, from scratch. i paint, though not as often as I would like. i love to make pottery on the wheel, though this hobby fell by the wayside while I was in grad school. now that I’ve finished, I’m looking forward to potentially getting back into ceramics and devoting more time and energy to all of my hobbies. my mom got me hooked on refinishing garage sale or thrift shop furniture into beautiful, rich pieces for the home. and my true love is crochet – i love the feeling of achievement in taking a ball of yarn and a hook and turning it into a beautiful afghan or purse or set of coasters. in some way or another, all of these hobbies center around making things – thus, creation nation. 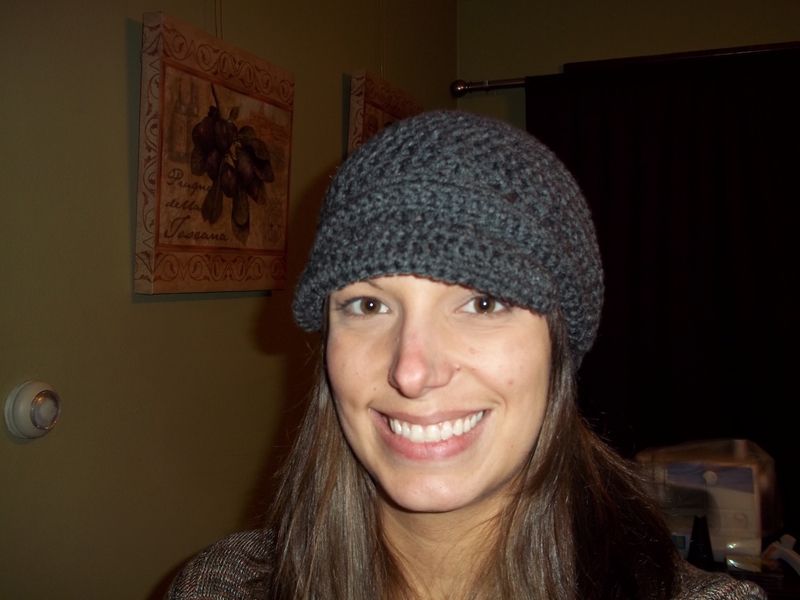 This entry was posted in Crochet and tagged crochet, hat. Bookmark the permalink.